Billy TK is dedicated to his craft, his faith and the Maori people. He often plays softer grooves strongly influenced by his spiritual journeys and the textures of Carlos Santana or John McLaughlin. He has a strong collection of original songs, often covered by other musicians but the only albums he’s released have been with Human Instinct and a rare release with his post-Instinct unit Te Whare Mana (Powerhouse) released on the Little wing label in Germany in the early 1980s. He’s always hauled out whenever there’s a Hendrix revival and can be seen regularly supporting his son Billy T K junior who’s building a reputation as a formidable guitarist in his own right. Billy senior now has competition from many fine guitarists across a range of musical styles but to many he is still the master. Billy had been learning guitar for some years and was picking up new sounds wherever he could. He found himself surrounded by skilled young musicians when his family made frequent visits to Ratana Pa. They were keen to teach him and he was eager to learn. His first gigs were playing with friends at family gatherings and then at youth clubs. Shortly after he left school he began to pull together his own band The Sinners with Ted Cash on drums, Sonny Ratana on bass and Harold Hine on rhythm guitar and lead vocalist Theo Swanson. He was among the first of a new breed of musician who began experimenting with new electronically enhanced guitar sounds. "The first guys I heard using distortion and those kinds of effects were the Pretty Things and that was well before Hendrix was even on the scene," he recalls. Billy’s aunty used to live over the back fence to the Mete family at Ratana Pa and he had formed a friendship with Ara Mete who later had a band called The Reasons based in Wellington. It was when The Reasons were performing on stage at the Pa in the mid-1960s that Ara, knowing Billy’s fascination for extending his guitar skills, gave him a gift - his first fuzz box and treble booster. "I took it to an electrical shop and got them to copy the circuit and that’s how I got mine, I used to take out resistors and play around trying to get an understanding of how the mechanics worked. I was experimenting with feedback before Hey Joe was released. That grounded me for the Instinct where I always had customised fuzz and wah wah peddles." 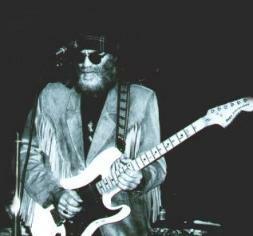 Billy T K was significantly influenced by hearing Jimi Hendrix’ Stone Free which he heard on the radio in 1967 so The Sinners quickly learned every Hendrix song until they had two albums of his material in their repertoire. The Sinners was reduced to a three piece when singer when Theo Swanson and guitarist Harold Hine left. Billy had been informed by Frank Greer who owned Rickies nightclub that his brother Maurice was coming back to town and was on the lookout for a new guitarist for his band Human Instinct. Billy was excited about the possibility but had already made plans to go to cross the Tasman and form a new unit in Melbourne. The promise of a job with Maurice Greer the famed stand-up drummer was incentive to stick around but Billy needed a break. He took the Melbourne trip spending several weeks hanging out with Kiwi musicians Paddy Beach and Reno Tehei who had previously played with Palmerston North unit The Cyclones which became Sounds Unlimited. Their Melbourne unit was called Compulsion and they were playing at the Thumping Tum club. Hanging out with Reno and Paddy was an inspiration. "I liked the scene but knew I wanted to put myself into a band where I could meet the other musicians on a different level." The Human Instinct rapidly took their own place as champions of hard-edged rock. Billy’s fiery yet controlled style, his use of the wah wah, his Hendrix-like afro, Greer’s stand up kit and flowing locks and the tumbling bass of Peter Barton mesmerised the locals. It was mainly cover songs at this stage but after a short trip back to the UK the band returned with bigger, better, more capable equipment and a repertoire of originals, including songs written by ex-pat Kiwi Doug Jerebine which later appeared on his rare Guitar Absolution album. 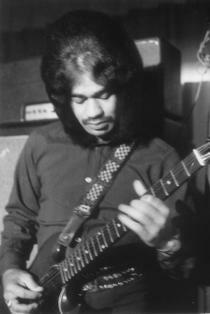 Billy stayed with the band for three subsequent albums Stoned Guitar, Burning Up Years and Pins In It, which elevated him and the band to legendary status. It was during a short tour to Australia in 1972 that disagreements over musical and personal direction reached a peak. Billy says the band was well received and is convinced if Human Instinct had stayed they would have "been huge" across the Tasman. The others felt they needed to get back home to their residency at Hatchett’s nightclub in Auckland. Their last gig was at a club in Brisbane. On the way back Billy announced he wouldn’t be returning with them bringing an end to perhaps the most important era of Human Instinct history. In the liner notes to the first box set Little Wing applauded Billy T K as "technically and melodically … one of the best and most innovative guitarists of the 70s" … the (first) box set ensuring "Billy T K his place beside Hendrix, Beck and Clapton". On their return to New Zealand after the rocky Australian tour Maurice Greer and Neil Edwards added new players to the Human Instinct line-up and continued gigging in Auckland. Meanwhile Billy who had remained in Sydney joined The Barry McGaskill Band playing Joe Cocker and Blood, Sweat & Tears style music and featuring another Kiwi, Yuk Harrison on bass. Within a couple of months however, he returned home with former Blackfeather drummer Steve Webb looking to form a new band. 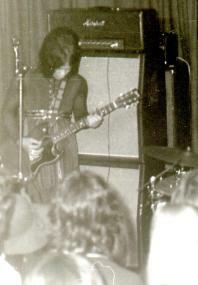 He recruited second guitarist John Bilderbeck from Wanganui and Gav Collinge on bass and named the unit Powerhouse. Rehearsals began in his bedroom at Bunnythorpe on the outskirts of Palmerston North. The material was early Crosby Stills, Nash & Young, Neil Young’s Southern Man and a 20-minute version of Elton John’s 60-Years On. The first gig as Powerhouse was at Palmerston North’s Nickerberg Coffee Lounge and thereafter the band mainly worked in Wellington where they played Ali Babs and a residency at Lucifer’s nightclub for about three months. Bilderbeck and Webb left and Billy went back to Palmerston North where he and Murray Taylor started their own nightclub called the Boulevarde in George St. The new Powerhouse featured Billy on guitar, Gav on bass, Ara Mete on rhythm guitar, Jamie Tait-Jamieson on keyboards, Bud Hooper (and at various other stages Neal Storey [Dragon] and Peter Kellington) on drums, Arnold Tihema on congas and lead vocals and Mahia Blackmore on vocals and percussion. Powerhouse remained in that residency and saw numerous players through its line-up over about 18 months. 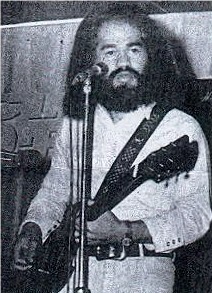 The band often double billed with top groups such as Blerta who would come down from Auckland for a weekend. The repertoire had shifted to become much more rhythmic with strong Santana influences. Powerhouse was also invited to record an album at HMV Studios in Wellington. They spend three days laying down tracks but nothing was ever released. During the Boulevarde residency the band was booked to play the Ngaruawahia music festival and took the spot just ahead of Black Sabbath. 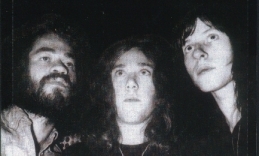 John Dix in his book Stranded in Paradise suggests the band never got the attention it deserved partly because of the troupe’s spiritual leanings which alienated the dope-smoking fraternity. "At one stage Billy did the whole Mahavishnu bit, standing there dressed in a kaftan and asking for a minute’s silence before each concert: ‘Through our music, our surrender of the soul will be expressed. The music will be expressed in forms of moods, feelings, relationships and our love for each other. This is what we are together for – the soul purpose of love. Everyone has that inner flame and sometimes it just takes the right time and place to kindle the same.’." The Boulevard got raided so many times or licensing infringements that it was forced to close down. Powerhouse continued to evolve with Billy moving to Feilding and adding Pihana Tahapihi on bass. At times embraced as many as 10 players. At its height the band played alongside Split Enz and supported Black Sabbath, John Mayall, Sonny Terry and Brownie McGee, UB40, Joe Satriani and the Neville Brothers. When Powerhouse folded Billy went to the US where he began to follow a spiritual path and ended up working in a Hollywood Studio with top rated players explorer new musical direction (see spiritual journeys in Hollywood). In April 1996 Billy in Christchurch with his youngest son Marahia, when they noticed an advertisement for a Santana concert. We flew to Wellington, booked into the local pub but didn’t have tickets. When I rang the venue I discovered the tickets had been sold out. So I found out who the promoter was only to discover they’d been trying to get me to be the support act. There was no way I could get the band together at that short notice but I offered to do a walk on," says Billy. The promoter said she’d ask Santana’s manager so Billy and son waited and waited in their hotel room and eventually the call came. There would be two tickets waiting at the venue. "We were excited that we had tickets. At the end the promoter came to our seats and took us out the back to meet Carlos in his dressing room. We talked away and he asked me to jam with him in Auckland the following night. So we flew up the next day. When we got to the Big Top it was packed," says Billy. "We went through security behind the stage and Carlos came out and shook my hand and asked what I wanted to play. I was going to say Black Magic Woman but I left that up to him. He said ‘Just be ready and I’ll call you’. He began to play Bob Marley’s Exodus – he didn’t call out the song or the key or anything, he just called out go! 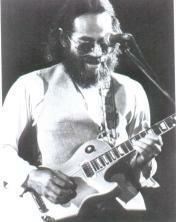 I started soloing but instead of trading licks he gave it all to me." It was 30-years since Billy T K’s split from Human Instinct in 1972 before he and Maurice Greer would appear on the same stage. Maurice had just returned from Melbourne to work on a new album at Revolver Studios when the two came face to face at a low-key gig at the Red Sox bar in Henderson where Billy was playing with his son. Maurice turned up to have a listen to his old school friend and sparring partner and pretty soon was invited onto the stage. It was a wild set running through old Cream and Hendrix tracks as if it was only yesterday. It seemed right that the past was laid to rest and the friendship restored. Within a matter of days Billy was in the studio playing on some of the old material being revisited at Revolver Studios, jamming with Maurice and Neil Edwards, the original 1971 version of the band: "It feels natural. Just like it’s yesterday," said Billy at the time. Billy and Maurice played together sporadically over the next couple of years, sometimes gigging for charity just to keep the connection humming or for private gigs and then when they heard Neil Edwards was having some cashflow difficulties at the Java Jive nightclub in Auckland they got together and added former Highway guitarist Phil Pritchard for a series of three gigs, which packed the house. It was the first time Neil had played with the band for 20-years. At the first two gigs Bill Ward the original Human Instinct guitarist who left after the first UK tour and was replaced by Billy T K played support on acoustic between sets. At the third gig old Powerhouse bass player Gav Collinge played the interval with his own original material. It was settled Human Instinct, even though it may take various forms – was back on the circuit and still able to pull the crowds. Maurice Greer and Billy are both working with a variety of musicians depending on their availability and the nature of the gig. Billy has a number of musicians he can call on up and down the country including old cohorts Ara Mete, Pihana on bass and drummers including Jim Lawrie (formerly Highway, Rockinghorse, Street Talk and Pink Flamingos). His main influence however is still Hendrix. "His music was disciplined. They were tight arrangements even though there was space for psychedelic influences his music was very structured." "Some gigs are more special. Some are just like another day at the office. We play about 75 per cent originals today. The rest is Hendrix material Hey Joe, Little Wing, Foxy Lady, Stone Free. The frequency at which Hendrix plays still touches people," says Billy. Billy seems flustered, even embarrassed when you mention all the polls that rate him as a guitar hero. "If they want to rate me in the polls then that’s okay but I am who I am, I play what I feel and that’s just me." He looks across the expanse of musical history that he’s played an important part in and it seems like another life. "I look back from afar and sometimes ask ‘is that really me. It feel like somebody else. I play different, walk different and talk different today. However, the grounding is still with me. It’s funny how we’re back into it again today," says the 55-year old legend.